I haven't really featured a lot about travel accommodations in my blog so this is also something I wanna do. I have always said that one's travel pleasure and overall satisfaction is one way or another directly proportional to your choice of accommodation. It doesn't have to be expensive, what suits your budget is the important thing.For sure, you will find something that fits your taste and lifestyle. 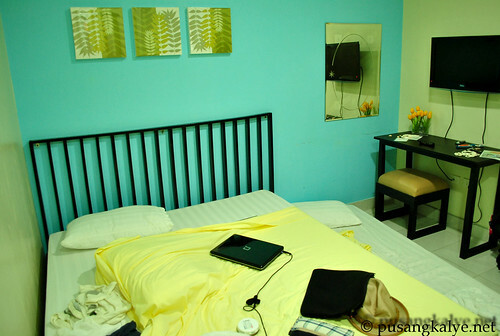 When in Palawan, and when deciding to stay downtown Puerto Princesa, I suggest you try MARIANNE HOME INN. They have four (4) different type of rooms which could cater to you depending on your number or budget. It's in the dormitory room where five (5) of us boys stayed during our sponsored tour of Puerto Prinsesa City sponsored by Airphil Express. At first I thought it's not going to be comfortable, but the moment I saw the room, all my worries evaporated. I looks spacious despite the 4 bunk beds inside. The room is really clean and well lighted. The airconditioner was enough to cool the room. The only setback in this type of accommodation is the restroom coz if there's 8 of you with the same time appointment, each should really be fast when using it. Other than that, I saw all the other rooms but the dormitory room is still my favorite. Perfect for the barkada. SINGLE OCCUPANCY Room for you at 900 php.Extra bed is at 395 pesos. Another thing that i love about Marianne Home In n is that it lives to it's name. It's an Inn which feels like home. On the ground floor is the dining area.Don't expect anything fancy. But one thing I can assure you, it feels like eating home lang. Feel good dining na parang nasa bahay kalang. Plus the food taste good. Parang lutong bahay din. Again, this is me being opinionated. Instead of reviewing only the accommodation, I wanna make sure I make my stand clear on this on. While there is joy and sense of triumph in knowing that you can do things on your own, especially in travelling, I still think that in most cases, it's best shared with others. What's happiness if you can't share it diba? Si creative dork ba iyong nakangiti't nakasalamin?? LOL. hmmm... thanks... i'll keep that in mind pag nadalaw palawan.... naman! sana nga makapagvacation akoh na dyan sa pinas... that'll be awesome... ingatz... Godbless! Sobrang natuwa ako sa Marianne Home Inn. Simple lang, malinis, maayos ang service, masarap ang food, mura.... definitely worth the money. Pag bumalik ako sa PPS, yan din ang irerecommend ko. But... more importantly... ang gwapo ko sa picture.